Well, it’s summer in the American Midwest and that means severe weather is either coming or going, day and night. Even when the thunderstorms are quiet, the skies tend toward overcast here, a fact that must frustrate the students running the public program at the Kirkwood Observatory at Indiana University. 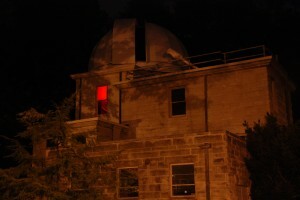 In theory, the observatory holds an open house every Wednesday evening. In practice, the weather frequently interferes with the schedule. Kirkwood Observatory, which stands on the western edge of Dunn Woods on IU’s campus, was named after Daniel Kirkwood, a professor of Mathematics at the university from 1856 until 1886. You might recognize his last name: Professor Kirkwood discovered (and more importantly, explained) what we now call the “Kirkwood gaps” in the asteroid belt. * He also proposed what is now known as (since disproved) Kirkwood’s Law. Professor Kirkwood retired in 1886 and passed away in 1895. Five years later, construction began on the observatory that would bear his name. William J. Hussey, an astronomer at the Lick Observatory, came to town to give the dedication talk, “Astronomy in Modern Life,” for the opening day of the new building on May 15, 1901. The observatory was outfitted wtih a 12″ (0.3m) refracting telescope, built by Warner & Swasey Company. Sadly, the observatory was almost instantly obsolete, not only because of its instrumentation, but because of light pollution from the growing town. By 1920, university astronomers were seeking a new venue for making observations. Financial difficulties slowed the search down, and it wasn’t until 1936 that Professor Cogshall convinced IU to fund a new observatory at Knightridge. Kirkwood Observatory has suffered a bit from neglect over the years, as the profession moved on to more sophisticated instrumentation (IU students working on observational astronomy now observe remotely, using the 3.5-m WIYN observatory at Kitt Peak in Arizona). The wood dome was in such sketchy condition by the 1990s that IU’s observational techniques class was held on the roof of Swain Hall West. Fortunately, the building and telescope received an overhaul in 2001. The telescope is now used for teaching and public programs. Judging from the crowds we’ve encountered at the observatory recently, interest in observational astronomy is alive and well in Bloomington, Indiana. Don’t forget to the check with the IU Astronomy Department before heading over the other observatory. They’ve been pretty good about keeping their twitter feed updated (@iuastro) on scheduled observing days. *The main asteroid belt in our solar system lies between Mars and Jupiter. When studying the distribution of the asteroids in this region, Kirkwood noticed that there were several gaps, or empty zones, in the belt. He proposed that these gaps were caused by the orbital resonance (gravitational disturbance) of Jupiter.